Fall is a prefect time of year to play around browns. I used Autumn Tilda with broom and log stamp. I punched out a variety leaves and sponged them with brown ink. Lastly I used Liquid Pearls to accent the image. Thanks so much for looking. I look forward to seeing your creations! Oh Chris! This is so lovely! The leaves are beautiful and I love the liquid pearls! She is perfect! I love the colors and the leaf swirl is beautiful too. Beautiful card, I love the colors and leafs. Super card Chris. love all the browns. Wow that is amazing and BEAUTIFUL....I love the leafs! I absolutely love your card!! it is great with the coloring with E's only!! just perfect!! well done!! I love your card. So perfect for this time of year. I am new to cardmaking, your website, and Copics so I have a whole lot to learn. I very much appreciate people like you who "share" their talent and knowledge. 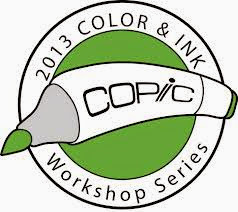 If I lived in NY I would attend all your classes, but I am in Southern Idaho, in a small farming town, and there is only 1 source for buying Copics and no classes. You didn't leave any contact info, but if you need some help let me know. I teach several long distance classes. Send me an email and I can give you more info. Gorgeous fall colors, Chris. Fabulous card. She's gorgeous and you did a fabulous job with the E's! Love it! She is beautiful and I love the leaves around her. Your coloring is fabulous. Great card. How courageous of you! The end result is fantastic! Wow! I love it! Now, if only I had the courage to give this technique a try. Copics are intimidating to me in the first place, LOL. You have it nailed! Great job! What an interesting card! Great coloring and lovely shape with gorgeous details.